Sleep medicine is a unique field as it represents a basic biologic process that affects everyone and has significant impact on the function of all organ systems. This characteristic allows for a novel measure of the field's success through evaluation of varying subspecialty disorders' outcome response to sleep medicine diagnostics and therapeutics. Neurologic disease is particularly liable to these interventions as sleep is primarily a neurologic process. Recent advancements made in sleep medicine are described through the significant impact it has made in common adult and pediatric neurologic diseases. A comprehensive sleep assessment in patients with neurologic disease should be viewed as a necessary element to both the initial evaluation, as well as yearly re-evaluations. At minimum, screening questions evaluating for excessive daytime sleepiness (EDS) and changes in sleep patterns should be performed. Patients with high risk responses, such as positive history of sleep disturbance, new symptoms of EDS, or development of sleep dysfunction, should receive a comprehensive sleep evaluation. 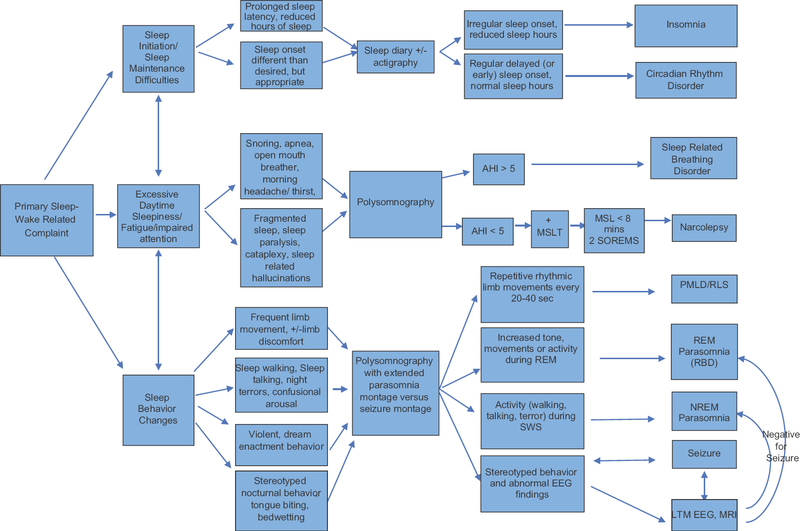 Investigations and objective data collection vary based on the most likely suspected sleep pathology [Figure 1]. For instance, patients with suspected insomnia may be asked to complete sleep diaries and actigraphy, whereas those suspected of sleep apnea, rapid eye movement (REM) behavior disorder, or narcolepsy will require sleep studies. It is important to consider that subjective complaints (e.g. EDS, sleep fragmentation) may not be well represented by the results of objective testing, such as polysomnography (PSG). 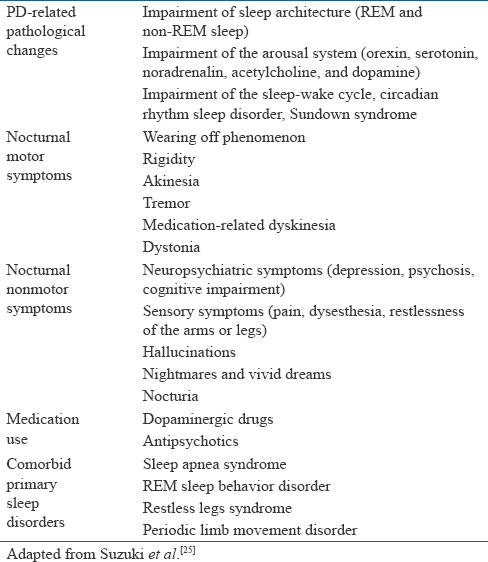 Figure 1: Symptom-based Approach to Diagnostics for Sleep–wake Disorders in Neurologic Disease. Abbreviations: AHI: Apnea Hypopnea Index; MSL: Mean Sleep Latency; MSLT: Multiple Sleep Latency Test; NREM: Nonrapid Eye Movement; PLMD: Periodic Limb Movement Disorder; RLS: Restless Leg Syndrome; RBD: REM Behavior Disorder; REM: Rapid Eye Movement; LTM: Long-term Monitoring; EEG: Electroencephalogram. Alzheimer's disease (AD) is the most common form of dementia in the United States. It affects one in 10 adults and is the sixth leading cause of death in America., Hallmark symptoms of AD are typically progressive deterioration of memory, language, and intellect; however, sleep–wake disturbances have become widely recognized as a common and often problematic behavioral symptom associated with AD. There is no curative therapy and treatments are only aimed at slowing the progression. 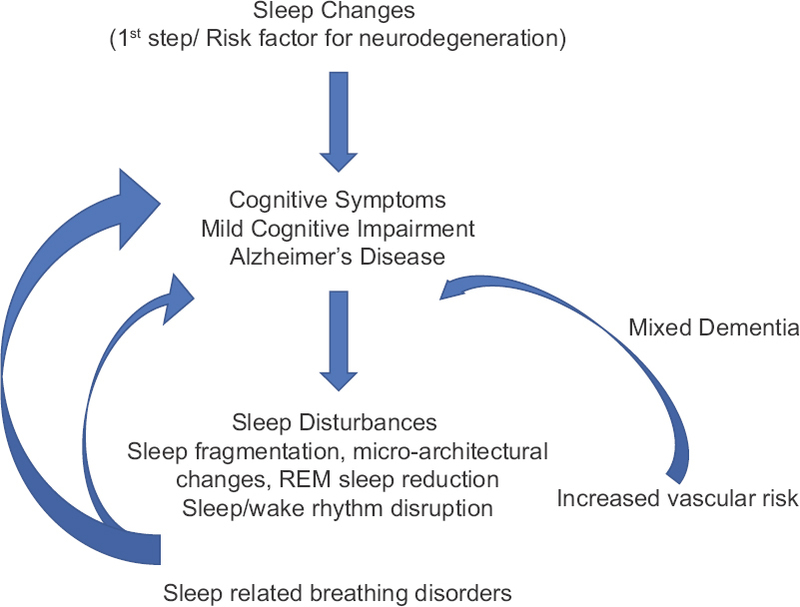 Sleep has become a key component of these treatment regimens, as there is a growing body of evidence for a causal and bidirectional relationship between cognitive decline and sleep disturbance. Micro-architectural sleep alterations are significantly increased in those with mild cognitive impairment, those with AD, and even seen in high-risk older adults (i.e. carriers of the APOE4 allele) relative to cognitively normal older adults.,, The decrease in nocturnal sleep, EDS, and sleep fragmentation is multifactorial. However, primary sleep disorders can be responsible for these symptoms and are present in approximately 60% of AD patients, with obstructive sleep apnea (OSA) and insomnia being the most common. Multiple sclerosis (MS) is a neurodegenerative autoimmune disorder of the central nervous system that affects about 2.5 million people in the world. Clinical symptoms, progression, and response to treatment can be variable; however, complaint of fatigue is more constant and present in up to 90% of patients. MS fatigue, however, is poorly characterized with no exact definition, accurate quantification, or etiology known. It is important to differentiate that fatigue and EDS are different symptoms. EDS is clearly defined as persistent sleepiness, even after adequate nighttime sleep. Fatigue, on the contrary, has been suggested to possibly be a direct result of demyelination and axonal loss or immunologic consequence versus a result of comorbidities found in MS, such as depression, medication side effects, pain, or sleep disturbance. The interaction between MS, sleep, and fatigue is likely very complex [Figure 3]. Disease progression and fatigue may be a result of immune dysregulation and impairment of the blood brain barrier related to sleep deprivation, as sleep difficulties have been reported in up to 80% of patients with MS. Sleep disorders, such as RLS, PLMD, narcolepsy–cataplexy syndrome, RBD, insomnia, and sleep apnea, are three times more likely to occur in patients with MS versus the general population. It is not uncommon for the sleep disorder to be a symptom of a white matter lesion, such as cervical lesions causing RLS, focal hypothalamic lesions causing narcolepsy, and dorsal pontine lesions causing RBD., In the case of insomnia, there are generally multiple contributing factors including, but not limited to depression, anxiety, pain, nocturia, and medication side effects. Sleep apnea can be central or obstructive and related to inactivity due to disability, brainstem lesions affecting the respiratory centers, or medications that relax muscle tone in the pharynx. Treatment of these disorders can provide symptomatic improvement in sleepiness and fatigue, but it is yet to be determined if there is benefit in disease stability and reduced progression. In addition, studies are also needed to better determine any differences or impact based on severity of MS (i.e. relapsing remitting versus progressive forms), or types of disease-modifying agents used as treatment. Figure 3: Proposed Relationship Between Multiple Scelerosis, Fatigue, and Sleep. The relationship between stroke and sleep is more complex than the widely accepted understanding such that untreated OSA increases the risk for stroke. In fact, there is evidence that there may be a circadian relationship, an association with number of sleep hours, worsening of acute stroke outcomes in untreated sleep disorder patients, and even clinical benefit of sleep interventions in post-stroke recovery. Additionally, the development of post-stroke sleep pathology is becoming more frequently recognized. It is well known that sleep disordered breathing (SDB), both directly and indirectly, increases the risk for stroke. OSA contributes to the development and progression of a metabolic syndrome through increased insulin resistance and deleterious effects on leptin and ghrelin, leading to lessened satiety and increased food-seeking behavior. Moreover, OSA can lead to cardiac dysrhythmias leading to cardio-embolic events resulting in stroke. However, the presence of SDB has also been shown to be associated with early neurologic worsening, higher blood pressures in the acute setting, negative impact on short-term and long-term neurologic recovery, increased mortality, and stroke recurrence risk.,, Total sleep time, with sleep hours of >9 or <6 h has also been found to contribute to stroke risk. Similarly, patients with insomnia have a 54% higher risk of developing stroke. Acute stroke outcomes are improved with continuous positive airway pressure (CPAP) use. It has been demonstrated that CPAP may help reduce recurrent cardiovascular events, improve 5-year mortality, and reduce nighttime blood pressure. The effect on stroke outcomes or recurrence after treatment of other sleep pathology, such as RLS or insomnia, is less clear, but would likely be beneficial based on stroke risk associated with those conditions. Post stroke, sleep pathology is increasingly recognized and can include multiple types of pathology. Insomnia, SDB, and EDS are common. However, based on location and severity of damage from the stroke, patients may also develop RBD, narcolepsy, and RLS., In addition, sleep pathology after stroke may also be related to other comorbidities, such as cardiac failure, anxiety, depression, or pain. This broad group includes muscular dystrophies, myotonic dystrophy, congenital and metabolic myopathies, myasthenia gravis, peripheral neuropathies (Charcot Marie Tooth syndrome, familial dysautonomia), post-polio syndrome, amyotrophic lateral sclerosis (ALS). Patients with neuromuscular disease are at high risk for developing sleep-related breathing disorders. A variety of mechanisms may contribute to this risk, including diaphragmatic, chest wall, and pharyngeal wall weakness, scoliosis, and restrictive lung disease. In addition, comorbid obesity, cerebral abnormalities, and physical deconditioning may further increase risk for OSA, but may also increase risk for other types of sleep pathology, such as restless leg syndrome, central sleep apnea, and insomnia. An attended in-lab PSG of these patients is beneficial. For one, screening for sleep pathology may improve early identification of disease progression. The most common SDB abnormality found in neuromuscular disease is hypopneas and hypoventilation with a saw tooth pattern of desaturations during phasic REM sleep, which can serve as an early identifier of respiratory muscle involvement. Second, attended PSG can include monitoring of end-tidal or transcutaneous carbon dioxide levels, which is generally the most sensitive indicator of hypoventilation, a common problem in these patients. Third, misclassification of apnea type (i.e. calling an obstructive event a central event) is common due to the inability of weak respiratory muscles to expand the chest or abdomen against an occluded airway, which may affect management recommendations. Finally, it may reduce mortality risk by early identification and treatment of symptoms associated with sudden death. For example, vocal cord paralysis frequently seen in ALS patients is strongly associated with sudden death, but this risk is reduced with the treatment using positive airway pressure (PAP) or tracheostomy. At this time, recommendations for PSG have been limited to patients with sleep complaints; however, consideration for using yearly sleep evaluations and PSG as part of a reassessment of disease progression should be strongly considered. Sleep is an autonomically dynamic period that exploits the vulnerability found in patients with neuromuscular disease; thus PSG may reveal signs of progression before there are clinically obvious changes. In addition, future studies evaluating the impact of OSA treatment on comorbidities seen in neuromuscular diseases, such as cardiomyopathy and weight problems are still needed. There is limited data available on other sleep disorders and their relationship with neuromuscular disease, which could be an active area of research in the future. Management is patient specific, based on the presence of sleep pathology and comorbid postconcussive symptoms. Emerging data suggest a more expedient return to physical activity, which may be protective against the development of postconcussive features and that brain rest may actually be prohibitive to recovery. In terms of sleep, physical activity encourages maintenance of circadian rhythm, maintains regular sleep–wake schedules, and may prevent development of secondary fatigue. The correct treatment of postconcussive sleep–wake disorders can result in rapid improvement in quality of life. An intimate relationship between sleep and epilepsy has been recognized since the days of Aristotle; however, the understanding of this relationship is now becoming better defined. Typically, the discussion of sleep and epilepsy focuses on sleep deprivation as a provoking agent for seizure and that some seizures are more likely to occur during sleep. It is now well established that sleep can affect frequency and occurrence of interictal spikes, as well as the occurrence, timing, and threshold of seizure. In addition, epilepsy can have deleterious effects on sleep architecture and negatively impact severity of sleep disorders. Seizure occurrence during sleep has also become better defined. Seizures are more likely to occur during NREM sleep, specifically in stages N1 and N2. On the contrary, REM sleep is found to be relatively protective. However, if there is presence of interictal spikes during REM sleep, they tend to be a reliable identification for localization of seizure onset. There is also a more established appreciation on the timing of seizures in relation to the circadian rhythm [Table 3]. Patients with epilepsy are at a higher risk for sleep disorders leading to poor quality and insufficient sleep. Nocturnal seizures can result in a significant reduction of REM sleep and sleep efficiency, while it can increase time spent in N1. Treatment of seizures can also affect sleep. Anti-epileptic medications can impact sleep architecture and sleep quality  and vagus nerve stimulators have been suggested to increase risk for SDB. The relationship between sleep and epilepsy is more of a vicious cycle when either is impaired. Poor sleep in epilepsy patients is multifactorial and is worsened by poorly controlled seizures, and poor sleep is associated with worsened quality of life, psychological function, and memory. The risk for sudden unexpected death in epilepsy (SUDEP) may be increased in these patients as well because of the instability and vulnerability during sleep. Improving sleep, specifically by treatment of OSA, has been noted to improve seizure frequency and an overall wellbeing in patients with epilepsy., Standardization for evaluation and implementation of sleep–wake disorders is needed to optimize seizure reduction, quality of life, and possibly impact SUDEP risk reduction. The recognition of the relationship of headache to sleep disorders has been expanded as well. The relationship of headache to RLS, PLMD, and narcolepsy has been added to the already appreciated relationship of headache to OSA and parasomnias. Migraine and restless leg syndrome have a strong association. RLS is more likely in migraine patients than controls and migraine is highly prevalent in patients with RLS. Again, a dopaminergic basis is suspected. Narcoleptic patients frequently complain of headache with studies demonstrating a migraine prevalence 2–4 times greater in narcolepsy patients. It is suggested that the relationship between narcolepsy and migraine might be related to orexin and the overlapping role in inhibition of analgesia and narcolepsy. Cluster headaches tend to occur in REM sleep. Obesity hypoventilation leads to early morning headaches. Bruxism has been seen to occur more frequently with tension headaches. The inclusion of a sleep assessment as a part of headache management is necessary. Sleep disturbances are now viewed as comorbid, predisposing, and even prognostic for headache development or persistence. However, longitudinal studies are still needed to better examine how headaches affect sleep and how sleep affects headaches. Autism spectrum disorder (ASD) is a neurodevelopmental disorder that is characterized by persistent deficits beginning in early childhood of social communication and interaction, restricted and repetitive behaviors, interests, or activities, and which are not better explained by intellectual disability or global developmental delay. However, not part of the diagnostic criteria for autism, sleep difficulties are almost universally characteristic of children with ASD. The most common being sleep onset and maintenance insomnia, however, SDB, restless leg syndrome, parasomnias, and other primary sleep disorders are also common, and not uncommonly occur together in an individual child. It is generally accepted that these sleep disorder likely compound the behavioral difficulties found in ASD, but recent studies suggest that it may also impact language and social development. In addition, there is evidence that there may be a genetic predisposition for poor sleep, possibly shared neurotransmitter abnormalities underlying both ASD and sleep dysfunction and perhaps, enhanced disability related to nutritional deficiencies. Children with ASD frequently have restricted diets due to food aversions that can result in nutritional deficiencies. This is becoming more recognized as a contributing factor to some sleep disturbances, such as iron deficiency and the development of RLS symptoms. Vitamin D and vitamin B12 supplementation have been associated with sleep improvement, but have not yet been evaluated in patients with ASD., This is a promising consideration for future studies to improve the sleep–wake cycle, particularly in ASD patients with evidenced nutritional deficiency. GABA (γ-aminobutyric acid), serotonin, and melatonin are neurotransmitters that have been identified as abnormal in ASD and also play a significant role in normal sleep–wake function. The abnormal expression of these neurotransmitters is suggested to influence the high incidence of sleep dysfunction in ASD. Additionally, there are subsets of patients who have been identified with genetic abnormalities that also influence these neurotransmitters, including GABA-related genes on chromosome 15q, as well as regulatory regions in three genes in the melatonin pathway: acetylserotonin-O-methyltransferase, melatonin receptor 1A, and melatonin receptor 1B. Future studies further exploring underlying genetic predisposition should also include clock genes that regulate sleep phase or sleep duration. It is anticipated that an improved understanding of these genetic variations and their effects on sleep will lead to more optimal and tailored therapies in the future. Recent studies, however, suggest that the relationship is more intimate and that ADHD symptoms may be a daytime phenotype of impaired nocturnal sleep [Figure 4]. Abnormal melatonin production has been linked with evidence of an impaired circadian rhythm and abnormal sleep in some patients with ADHD., In addition, there is suggestion that the administration of methylphenidates may also impact endogenous production of melatonin. Studies evaluating exogenous administration of melatonin have had relatively consistent findings of improved sleep in patients with ADHD., Further studies are needed to evaluate melatonin supplementation's impact on ADHD symptoms. 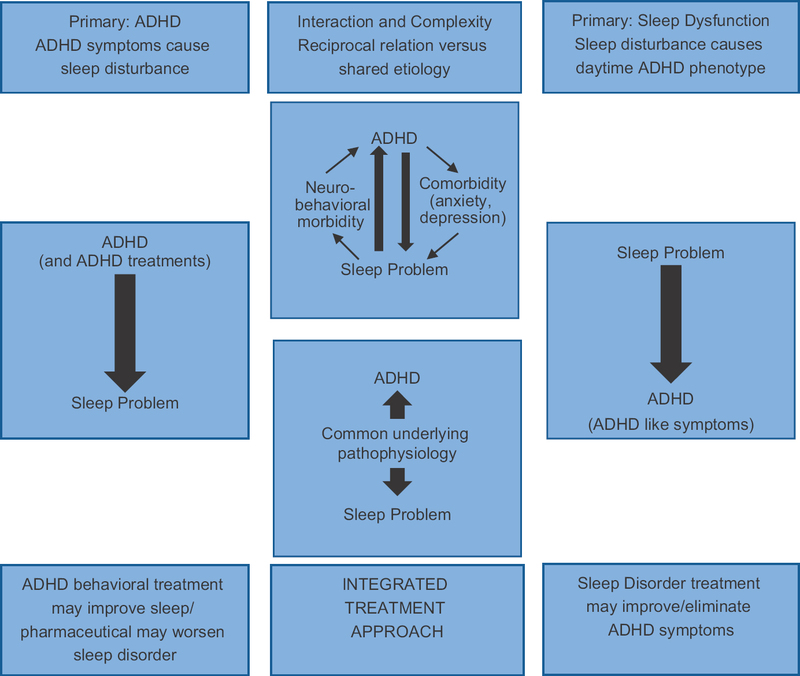 Figure 4: Conceptual Model of Relationship Between ADHD and Disordered Sleep (Modified From Hvolby, 2015). SDB is much more prevalent in children with ADHD than in the general pediatric population (25–30% versus 1–3%). Both surgical treatment of OSA and treatment with CPAP have demonstrated significant improvement in ADHD-like symptoms, as well as academic performance, sometimes resulting in the ability to discontinue ADHD medications.,, Large-scale, randomized, controlled studies are needed to better understand this relationship. These studies may also identify the demographic at-risk population, and improve understanding of the characteristics that make an individual vulnerable to development of ADHD symptoms, as these symptoms are not uniformly present in all children with OSA or sleep disruption. Sleep disorders are common in diverse neurological disorders, but are often overlooked. It is important to appropriately screen for various sleep disorders on diagnosis of the neurologic syndrome, as well as institute timely reassessments for future development of sleep disorders with time [Figure 5]. Sleep medicine has been traditionally assessed by steps taken in the diagnosis and management of sleep–wake disorders, with the main endpoint being improvement in the sleep disorder as well as improved quality of life features. Advancements in sleep medicine have reinforced the role of appropriate identification and management of sleep disorders in providing improved insight into the pathogenesis for neurologic diseases, therapeutic intervention to manage neurologic disease, and also a potential tool to monitor progression of disease. This reinforces the need for comprehensive management with a multidisciplinary approach, to screen for and manage sleep disorders in neurologic disease. In addition, it underlines the necessity for future research to better develop and standardize the utilization of sleep evaluation and management in the care of patients with neurologic disease. Shepard JW, Buysse DJ, Chesson AL, Dement WC, Goldberg R, Guilleminault C, et al. History of the development of sleep medicine in the United States. J Clin Sleep Med 2005;1:61-82. Johns MW. Reliability and factor analysis of the Epworth Sleepiness Scale. Sleep 1992;15:376-81. Chung F, Subramanyam R, Liao P, Sasaki E, Shapiro C, Sun Y. High STOP-Bang score indicates a high probability of obstructive sleep apnoea. Br J Anaesth 2012;108:768-75. Morin CM, Belleville G, Belanger L, Ivers H. The Insomnia Severity Index: psychometric indicators to detect insomnia cases and evaluate treatment response. Sleep 2011;34:601-8. Alzheimer's Association. 2015 Alzheimer's disease facts and figures. Alzheimers Dement 2015;11:332-84. Mander BA, Winer JR, Jagust WJ, Walker MP. Sleep: a novel mechanistic pathway, biomarker, and treatment target in the pathology of Alzheimer's disease? Trends Neurosci 2016;39:552-66. Peter-Derex L, Yammine P, Bastuji H, Croisile B. Sleep and Alzheimer's disease. Sleep medicine reviews 2015;19:29-38. Ohayon MM, Carskadon MA, Guilleminault C, Vitiello MV. Meta-analysis of quantitative sleep parameters from childhood to old age in healthy individuals: developing normative sleep values across the human lifespan. Sleep-New York Then Westchester 2004;27:1255-74. Liguori C, Romigi A, Nuccetelli M, Zannino S, Sancesario G, Martorana A, et al. Orexinergic system dysregulation, sleep impairment, and cognitive decline in Alzheimer disease. JAMA neurology 2014;71:1498-505. Mander BA, Marks SM, Vogel JW, Rao V, Lu B, Saletin JM,et al. [beta]-amyloid disrupts human NREM slow waves and related hippocampus-dependent memory consolidation. Nat Neurosci 2015;18:1051-7. Spira AP, Gamaldo AA, An Y, Wu MN, Simonsick EM, Bilgel M, et al. Self-reported sleep and β-amyloid deposition in community-dwelling older adults. JAMA neurology 2013;70:1537-43. Sprecher KE, Bendlin BB, Racine AM, Okonkwo OC, Christian BT, Koscik RL, et al. Amyloid burden is associated with self-reported sleep in nondemented late middle-aged adults. 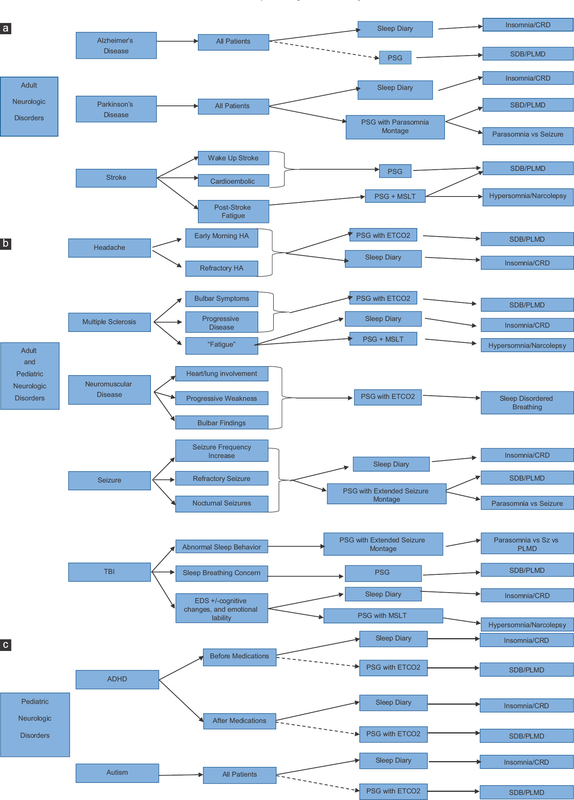 Neurobiol Aging 2015;36:2568-76. Westerberg CE, Mander BA, Florczak SM, Weintraub S, Mesulam M, Zee PC, et al. Concurrent impairments in sleep and memory in amnestic mild cognitive impairment. Journal of the International Neuropsychological Society 2012;18:490-500. Prinz PN, Vitaliano PP, Vitiello MV, Bokan J, Raskind M, Peskind E, et al. Sleep, EEG and mental function changes in senile dementia of the Alzheimer's type. Neurobiol Aging 1983;3:361-70. Hita-Yanez E, Atienza M, Gil-Neciga E, L Cantero J. Disturbed Sleep Patterns in Elders with Mild Cognitive Impairment: The Role of Memory Decline and ApoE ε 4 Genotype. Current Alzheimer Research 2012;9:290-7. McCurry SM, Reynolds CF, Ancoli-Israel S, Teri L, Vitiello MV. Treatment of sleep disturbance in Alzheimer's disease. Sleep Medicine Reviews 2000;4(6):603-628. Ancoli-Israel S, Palmer BW, Cooke JR, Corey-Bloom J, Fiorentino L, Natarajan L, et al. Cognitive effects of treating obstructive sleep apnea in Alzheimer's disease: a randomized controlled study. J Am Geriatr Soc 2008;56:2076-81. Chong MS, Ayalon L, Marler M, Loredo JS, Corey-Bloom J, Palmer BW, et al. Continuous positive airway pressure reduces subjective daytime sleepiness in patients with mild to moderate Alzheimer's disease with sleep disordered breathing. J Am Geriatr Soc 2006;54:777-81. Prudon B, Duncan GW, Khoo TK, Yarnall AJ, Burn DJ, Anderson KN. Primary sleep disorder prevalence in patients with newly diagnosed Parkinson's disease. Movement Disorders 2014;29:259-62. Neikrug AB, Maglione JE, Liu L, Natarajan L, Avanzino JA, Corey-Bloom J,et al. Effects of sleep disorders on the non-motor symptoms of Parkinson disease. J clin sleep med 2013;9(11):1119-1129. Rolinski M, Szewczyk-Krolikowski K, Tomlinson PR, Nithi K, Talbot K, Ben-Shlomo Y, et al. REM sleep behaviour disorder is associated with worse quality of life and other non-motor features in early Parkinson's disease. J Neurol Neurosurg Psychiatry 2014;85:560-6. Suzuki K, Miyamoto M, Miyamoto T, Hirata K. Parkinson's disease and sleep/wake disturbances. Current neurology and neuroscience reports 2015;15:1-11. Chaudhuri KR, Pal S, DiMarco A, Whately-Smith C, Bridgman K, Mathew R, et al. The Parkinson's disease sleep scale: a new instrument for assessing sleep and nocturnal disability in Parkinson's disease. J Neurol Neurosurg Psychiatry 2002;73:629-35. Trenkwalder C, Kohnen R, Högl B, Metta V, Sixel-Döring F, Frauscher B, et al. Parkinson's disease sleep scale-validation of the revised version PDSS-2. Movement Disorders 2011;26:644-52. Strober LB. Fatigue in multiple sclerosis: a look at the role of poor sleep. 2015. He J, Hsuchou H, He Y, Kastin AJ, Wang Y, Pan W. Sleep restriction impairs blood-brain barrier function. J Neurosci 2014;34:14697-706. Braley TJ, Chervin RD, Segal BM. Fatigue, tiredness, lack of energy, and sleepiness in multiple sclerosis patients referred for clinical polysomnography. Mult Scler Int 2012;2012:673936. 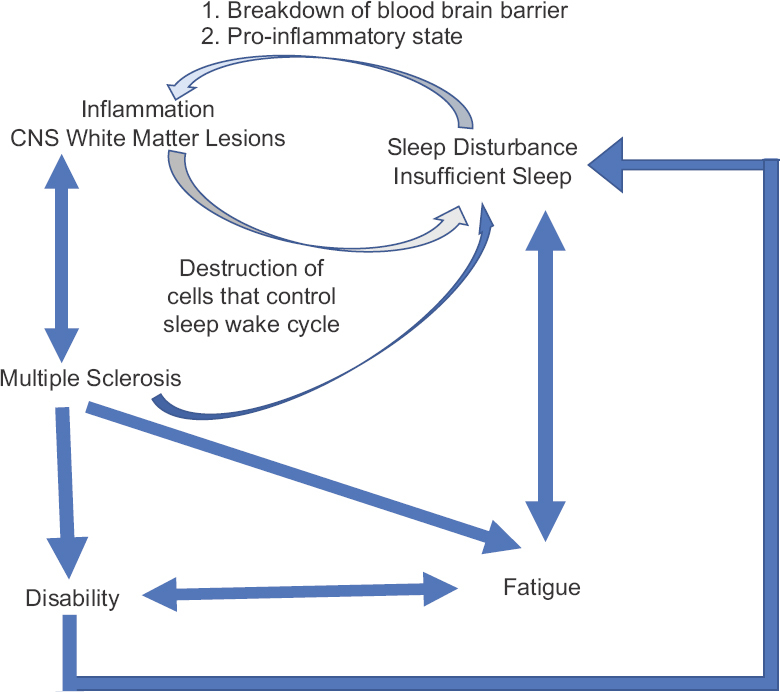 Sleep disorders in multiple sclerosis. Seminars in neurology: Copyright© 2005 by Thieme Medical Publishers, Inc., 333 Seventh Avenue, New York, NY 10001, USA. 2005. Moreira N, Damasceno R, Medeiros C, De Bruin P, Teixeira C, Horta W, et al. Restless leg syndrome, sleep quality and fatigue in multiple sclerosis patients. Brazilian Journal of Medical and Biological Research 2008;41:932-7. Young T, Finn L, Peppard PE, Szklo-Coxe M, Austin D, Nieto FJ,et al. Sleep disordered breathing and mortality: eighteen-year follow-up of the Wisconsin sleep cohort. Sleep 2008;31:1071-8. Yan-fang S, Yu-ping W. Sleep-disordered breathing: impact on functional outcome of ischemic stroke patients. Sleep Med 2009;10:717-9. Iranzo A, Santamaria J, Berenguer J, Sanchez M, Chamorro A. Prevalence and clinical importance of sleep apnea in the first night after cerebral infarction. Neurology 2002;58:911-6. Wu MP, Lin HJ, Weng SF, Ho CH, Wang JJ, Hsu YW. Insomnia subtypes and the subsequent risks of stroke: report from a nationally representative cohort. Stroke 2014;45:1349-54. Martínez-García MÁ, Soler-Cataluña JJ, Ejarque-Martínez L, Soriano Y, Román-Sánchez P, Illa FB, et al. Continuous positive airway pressure treatment reduces mortality in patients with ischemic stroke and obstructive sleep apnea: a 5-year follow-up study. American journal of respiratory and critical care medicine 2009;180:36-41. Culebras A, Moore JT. Magnetic resonance findings in REM sleep behavior disorder. Neurology 1989;39:1519-23. Lee S, Kim J, Song I, An J, Kim Y, Lee K. Poststroke restless legs syndrome and lesion location: anatomical considerations. Movement Disorders 2009;24:77-84. Raphaelson M, Inati SK. Treating sleep disorders in neurology practice. Neurol Clin 2012;30:1007-25. Aboussouan LS. Sleep-disordered breathing in neuromuscular disease. American journal of respiratory and critical care medicine 2015;191:979-89. Weinberg J, Klefbeck B, Borg J, Svanborg E. Polysomnography in chronic neuromuscular disease. Respiration 2003;70:349-54. Gozal D, Thiriet P. Respiratory muscle training in neuromuscular disease: long-term effects on strength and load perception. Med Sci Sports Exerc 1999;31:1522-7. Pinto A, Evangelista T, Carvalho Md, Alves M, Luis MS. Respiratory assistance with a non-invasive ventilator (Bipap) in MND/ALS patients: survival rates in a controlled trial. J Neurol Sci 1995;129:19-26. Simonds AK. Recent advances in respiratory care for neuromuscular disease. CHEST Journal 2006;130:1879-86. Langlois JA, Rutland-Brown W, Wald MM. The epidemiology and impact of traumatic brain injury: a brief overview. J Head Trauma Rehabil 2006;21:375-8. Ouellet MC, Beaulieu-Bonneau S, Morin CM. Insomnia in patients with traumatic brain injury: frequency, characteristics, and risk factors. J Head Trauma Rehabil 2006;21:199-212. Baumann CR, Werth E, Stocker R, Ludwig S, Bassetti CL. Sleep-wake disturbances 6 months after traumatic brain injury: a prospective study. Brain 2007;130:1873-83. Castriotta RJ, Murthy JN. Sleep disorders in patients with traumatic brain injury. CNS drugs 2011;25:175-85. Mathias J, Alvaro P. Prevalence of sleep disturbances, disorders, and problems following traumatic brain injury: a meta-analysis. Sleep Med 2012;13:898-905. Nardone R, Bergmann J, Kunz A, Caleri F, Seidl M, Tezzon F, et al. Cortical excitability changes in patients with sleep-wake disturbances after traumatic brain injury. J Neurotrauma 2011;28:1165-71. Shekleton JA, Parcell DL, Redman JR, Phipps-Nelson J, Ponsford JL, Rajaratnam SM. Sleep disturbance and melatonin levels following traumatic brain injury. Neurology 2010;74:1732-8. Seifman MA, Adamides AA, Nguyen PN, Vallance SA, Cooper DJ, Kossmann T, et al. Endogenous melatonin increases in cerebrospinal fluid of patients after severe traumatic brain injury and correlates with oxidative stress and metabolic disarray. Journal of Cerebral Blood Flow & Metabolism 2008;28:684-96. Morse AM, Kothare SV, Sleep Disorders and Concussion. In Handbook of Clinical Neurology Elsevier 2018;158:127-34. Ouellet M, Beaulieu-Bonneau S, Morin CM. Sleep-wake disturbances after traumatic brain injury. The Lancet Neurology 2015;14:746-57. Chaput G, Giguère J, Chauny J, Denis R, Lavigne G. Relationship among subjective sleep complaints, headaches, and mood alterations following a mild traumatic brain injury. Sleep Med 2009;10:713-6. Fichtenberg NL, Zafonte RD, Putnam S, Mann NR and Millard AE. Insomnia in a post-acute brain injury sample. Brain Injury 2002;16:197-206. Sufrinko A, Pearce K, Elbin RJ, Covassin T, Johnson E, Collins M, et al. The effect of preinjury sleep difficulties on neurocognitive impairment and symptoms after sport-related concussion. Am J Sports Med 2015;43:830-8. Hou L, Han X, Sheng P, Tong W, Li Z, Xu D, et al. Risk factors associated with sleep disturbance following traumatic brain injury: clinical findings and questionnaire based study. PLoS One 2013;8:e76087. Grool AM, Aglipay M, Momoli F, Meehan WP, Freedman SB, Yeates KO, et al. Association between early participation in physical activity following acute concussion and persistent postconcussive symptoms in children and adolescents. JAMA 2016;316:2504-14. Barlow KM. Postconcussion syndrome: A review. J Child Neurol 2014;31:57-67. Ng M, Pavlova M. Why are seizures rare in rapid eye movement sleep? Review of the frequency of seizures in different sleep stages. Epilepsy Res Treat 2013;2013:932790. Mirzoev A, Bercovici E, Stewart LS, Cortez MA, Snead OC, Desrocher M. Circadian profiles of focal epileptic seizures: a need for reappraisal. Seizure 2012;21:412-6. Touchon J, Baldy-Moulinier M, Billiard M, Besset A, Cadilhac J. Sleep organization and epilepsy. Epilepsy Res Suppl 1991;2:73-81. Jain SV, Glauser TA. Effects of epilepsy treatments on sleep architecture and daytime sleepiness: An evidence-based review of objective sleep metrics. Epilepsia 2014;55:26-37. Parhizgar F, Nugent K, Raj R. Obstructive sleep apnea and respiratory complications associated with vagus nerve stimulators. J Clin Sleep Med 2011;7:401-7. Pornsriniyom D, won Kim H, Bena J, Andrews ND, Moul D, Foldvary-Schaefer N. Effect of positive airway pressure therapy on seizure control in patients with epilepsy and obstructive sleep apnea. Epilepsy & Behavior 2014;37:270-5. Segal E, Vendrame M, Gregas M, Loddenkemper T, Kothare SV. Effect of treatment of obstructive sleep apnea on seizure outcomes in children with epilepsy. Pediatr Neurol 2012;46:359-62. Evers S. Sleep and headache: the biological basis. Headache: The Journal of Head and Face Pain 2010;50:1246-51. Akerman S, Goadsby P. Dopamine and migraine: biology and clinical implications. Cephalalgia 2007;27:1308-14. Mascia A, Qqaacute, fra J, Schoenen J. Dopamine and migraine: A review of pharmacological, biochemical, neurophysiological, and therapeutic data. Cephalalgia 1998;18(4):174-182. Schurks M, Winter A, Berger K, Kurth T. Migraine and restless legs syndrome: A systematic review. Cephalalgia 2014;34:777-94. Dahmen N, Kasten M, Wieczorek S, Gencik M, Epplen J, Ullrich B. Increased frequency of migraine in narcoleptic patients: a confirmatory study. Cephalalgia 2003;23:14-9. Holland P. Modulation of trigeminovascular processing: novel insights into primary headache disorders. Cephalalgia 2009;29:1-6. Vendrame M, Kaleyias J, Valencia I, Legido A, Kothare SV. Polysomnographic findings in children with headaches. Pediatr Neurol 2008;39:6-11. Botting N, Baraka N. Sleep behaviour relates to language skills in children with and without communication disorders. Int J Dev Disabil 2017. p. 1-6. Dosman CF, Brian JA, Drmic IE, Senthilselvan A, Harford MM, Smith RW, et al. Children with autism: effect of iron supplementation on sleep and ferritin. Pediatr Neurol 2007;36:152-8. Gominak S, Stumpf W. The world epidemic of sleep disorders is linked to vitamin D deficiency. Med Hypotheses 2012;79:132-5. Ohta T, Ando K, Iwata T, Ozaki N, Kayukawa Y, Terashima M, et al. Treatment of persistent sleep-wake schedule disorders in adolescents with methylcobalamin (vitamin B12). Sleep 1991;14:414-8. Levitt P, Eagleson KL, Powell EM. Regulation of neocortical interneuron development and the implications for neurodevelopmental disorders. Trends Neurosci 2004;27:400-6. McCauley JL, Olson LM, Delahanty R, Amin T, Nurmi EL, Organ EL, et al. A linkage disequilibrium map of the 1-Mb 15q12 GABAA receptor subunit cluster and association to autism. American Journal of Medical Genetics Part B: Neuropsychiatr Genet 2004;131:51-9. Jonsson L, Ljunggren E, Bremer A, Pedersen C, Landén M, Thuresson K, et al. Mutation screening of melatonin-related genes in patients with autism spectrum disorders. BMC medical genomics 2010;3:10. Weiss MD, Craig SG, Davies G, Schibuk L, Stein M. New research on the complex interaction of sleep and ADHD. Curr Sleep Med Rep 2015;1:114-21. Stein MA, Weiss M, Hlavaty L. ADHD treatments, sleep, and sleep problems: complex associations. Neurotherapeutics 2012;9:509-17. Graham J, Banaschewski T, Buitelaar J, Coghill D, Danckaerts M, Dittmann R, et al. European guidelines on managing adverse effects of medication for ADHD. Eur Child Adolesc Psychiatry 2011;20:17-37. Scott N, Blair PS, Emond AM, Fleming PJ, Humphreys JS, Henderson J, et al. Sleep patterns in children with ADHD: a population-based cohort study from birth to 11 years. J Sleep Res 2013;22:121-8. Hansen BH, Skirbekk B, Oerbeck B, Wentzel-Larsen T, Kristensen H. Associations between sleep problems and attentional and behavioral functioning in children with anxiety disorders and ADHD. Behav Sleep Med 2014;12:53-68. Hvolby A. Associations of sleep disturbance with ADHD: implications for treatment. ADHD Attention Deficit and Hyperactivity Disorders 2015;7:1-18. Nováková M, Paclt I, Ptáček R, Kuželová H, Hájek I, Sumová A. Salivary melatonin rhythm as a marker of the circadian system in healthy children and those with attention-deficit/hyperactivity disorder. Chronobiol Int 2011;28:630-7. Van Veen MM, Kooij JS, Boonstra AM, Gordijn MC, Van Someren EJ. Delayed circadian rhythm in adults with attention-deficit/hyperactivity disorder and chronic sleep-onset insomnia. Biol Psychiatry 2010;67:1091-6. Molina-Carballo A, Naranjo-Gómez A, Uberos J, Justicia-Martínez F, Ruiz-Ramos M, Cubero-Millán I, et al. Methylphenidate effects on blood serotonin and melatonin levels may help to synchronise biological rhythms in children with ADHD. J Psychiatr Res 2013;47:377-383. Mohammadi MR, Mostafavi SA, Keshavarz SA, Eshraghian MR, Hosseinzadeh P, Hosseinzadeh-Attar MJ, et al. Melatonin effects in methylphenidate treated children with attention deficit hyperactivity disorder: a randomized double blind clinical trial. Spring. Iran J Psychiatry 2012;7:87-92. Weiss MD, Wasdell MB, Bomben MM, Rea KJ, Freeman RD. Sleep hygiene and melatonin treatment for children and adolescents with ADHD and initial insomnia. Journal of the American Academy of Child & Adolescent Psychiatry 2006;45:512-9. Soylu E, Soylu N, Yıldırım YS, Sakallıoğlu Ö, Polat C, Orhan İ. Psychiatric disorders and symptoms severity in patients with adenotonsillar hypertrophy before and after adenotonsillectomy. Int J Pediatr Otorhinolaryngol 2013;77:1775-81. Beebe DW. Neurobehavioral morbidity associated with disordered breathing during sleep in children: a comprehensive review. Sleep 2006;29:1115-34. Chervin RD, Ruzicka DL, Giordani BJ, Weatherly RA, Dillon JE, Hodges EK, et al. Sleep-disordered breathing, behavior, and cognition in children before and after adenotonsillectomy. Pediatrics 2006;117:e769-78.